Mystery pond fish sighted again. I haven't been able to spot my baby fish in the pond for about three weeks so I assumed it was probably a dragon fly nymph or something like that. Tonight the water is finally clear since we haven't had downpours yet today and there it was. I got a few photos but only had my phone and they are bad! But, I am really thinking one of those mollies made the trip down to the pond in the plants or duck weed I take down there every week. 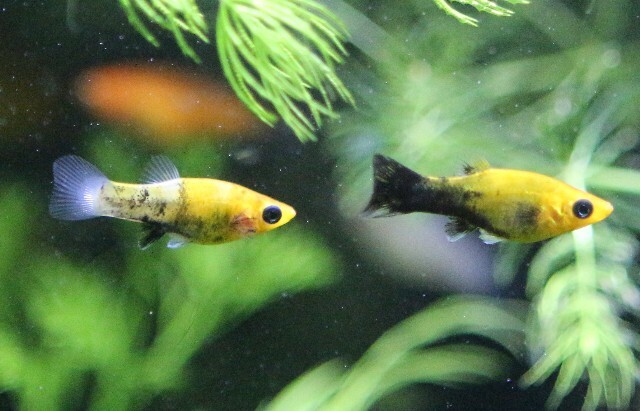 It is the same color as the four still in the tank but is bigger than they are, not surprising since it has a whole pond. It doesn't swim like a goldfish, it is much faster and uses its tail more, if that makes sense. I am off work tomorrow so will try to get better photos but I really don't know what it is! 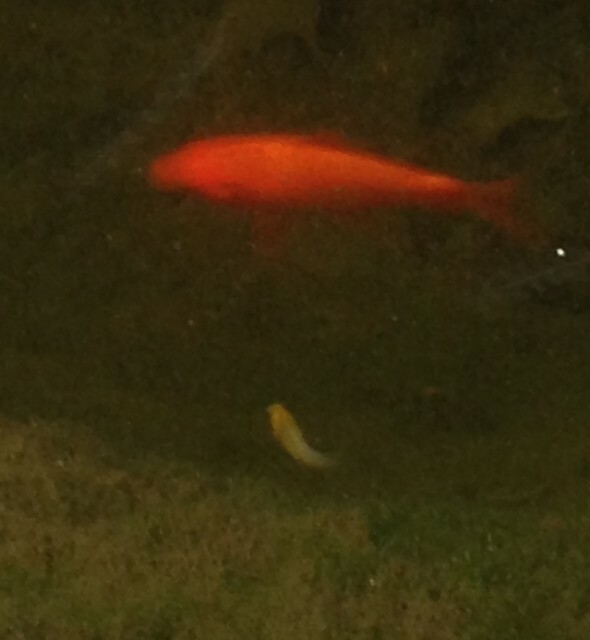 Re: Mystery pond fish sighted again. Well I guess Jaws and the Loch Ness Monster are both out of the question and I'm pretty sure it's not a whale of any sort. So I guess that means you have got me stumped. Call Scotland Yard and have them launch an investigation. No harm in trying. Good luck with your mystery fish, maybe you will get to name a new species. The mystery deepens. This is getting suspenseful. huhuhu! This is very mysterious! I hope you get to find out what kind of fish it is! I really do hope you figure out this mystery. I was at Walmart today and saw a bunch of baby goldfish... 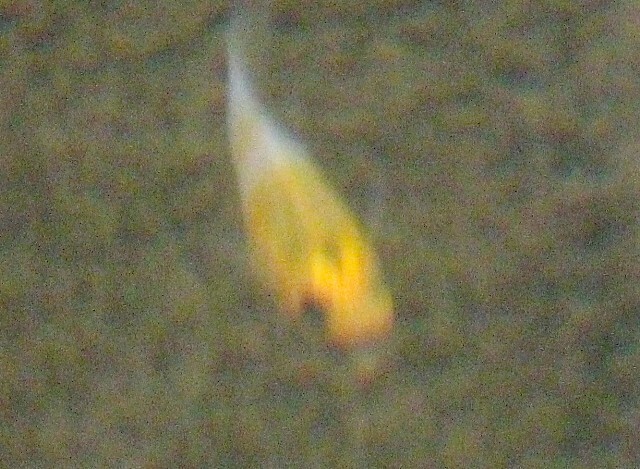 I am pretty sure it IS a goldfish now, but I will head down later with my better camera and get some proof. 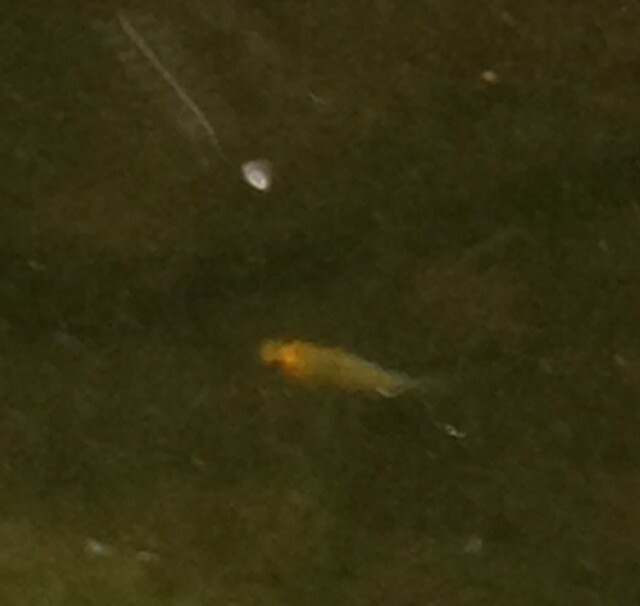 Definitely a gold fish, I "think". And, tonight I saw some that are tadpole sized. No frogs in the pond so they aren't tadpoles. 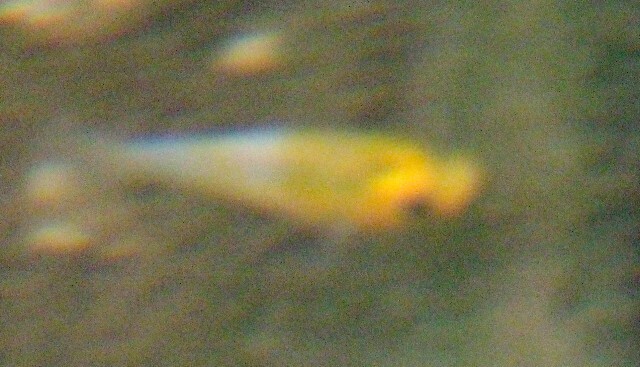 I am pretty sure my Koi aren't old enough to make babies yet, they are still well under a year old but the goldies are plenty old enough. Looks like it's going to be orange and white, and I do have several that color. Here's more photos, but it was cloudy and I used a long lens so they still aren't good, but at least you can tell it is orange and white and not a molly! The mystery is over, and it is NOT a goldfish!!!!! The mystery fish has turned into a molly, a WHITE molly no less. I was convinced it was a goldie, especially since I discovered five others the same size when I brought them in for the Winter. Well, they are in a tank in my store and today I really got looking at the white one. 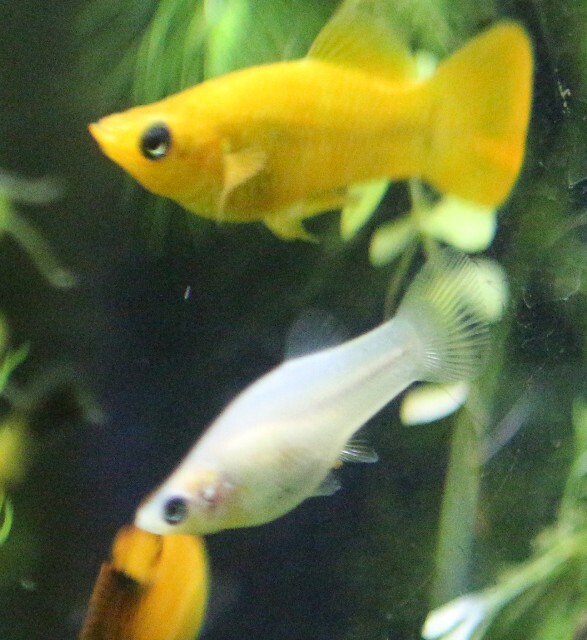 First of all, she is MUCH smaller than the goldies, but the real giveaway was noticing the round tail instead of the goldie fan tail AND the tell tale black Molly eyes. Now I notice subtle differences such as head shape, length of spine, mouth shape, etc. Sooo, obviously she was moved out with some of the plants or duckweek I was taking out by the bucketsful all Summer. 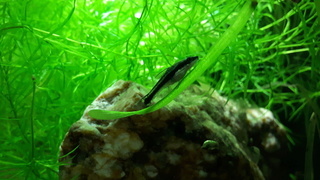 I am going to bring her home to the Molly tank and will get photos then. Happy your mystery is solved!!!! OR is it for sure?! 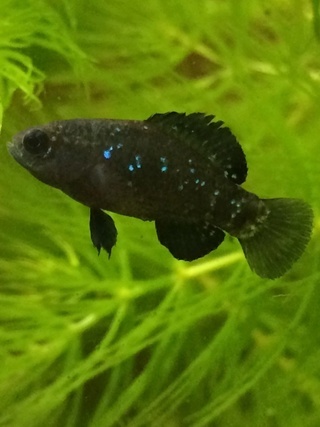 I wish I knew if she was from the same drop as the ones currently in my tank. She was the same color as they were in the beginning but they stayed orange and black and she is completely white. She is also MUCH bigger than they are, but that could certainly be due to having 1300 gallons and natural sun instead of 29 gallons in the tank in the house. I kept thinking she was the strangest colored goldfish I had ever seen, but couldn't ever get close enough to notice the tail, etc. Okay, experts... this really IS a molly, correct??? 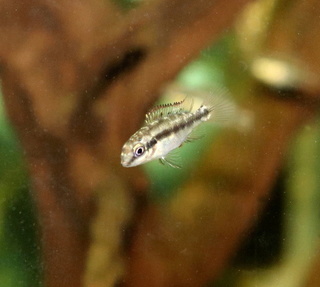 First photo, the male Molly certainly thinks she is one of his own kind and she's only been in there five minutes. And, these are some of the others. The white one was this color when I first spotted her in the pond. 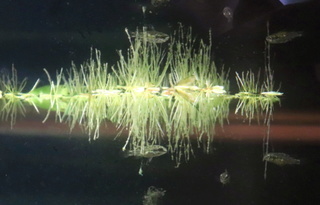 She's MUCH bigger than they are BUT was NOT noticed in my tank and I didn't take plants down to the pond until these black and orange ones were born. It almost looks like one of them is turning white in spots as well. The white one wasn't fully white until a couple of weeks ago. Could they be from the same drop???? ?